Give a kid a classic! Cozy Classics is the popular board book series that presents well-loved stories to children aged 0+ through twelve child-friendly words and twelve needle-felted illustrations. 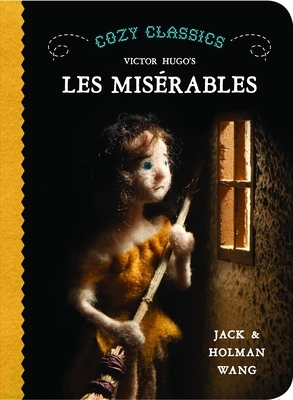 Les Misérables is Victor Hugo’s sweeping French saga about one man’s search for redemption in a world of hardship and misery, and is one of the world’s most beloved classics. Now you can share this classic with children of any age. Jack and Holman Wang are twin brothers who grew up in Vancouver, British Columbia. They first began writing and illustrating books together in the third grade.Jack earned a Master of Fine Arts degree in creative writing from the University of Arizona and a Ph.D. in English with an emphasis in creative writing from Florida State University, where his major area was the history of the novel. He is currently an Assistant Professor in the Department of Writing at Ithaca College in Ithaca, New York, where he specializes in fiction writing. Holman, an artist and former middle school teacher, holds a bachelor's degree in education and a master's degree in architecture history, both from the University of British Columbia. He is the author of "Bathroom Stuff," a nonfiction coffee table book on the history of everything in your bathroom, published by SourceBooks in 2001. His work has been featured in newspapers and on TV and radio, including NPR and the CBC.Jack has three and one year-old daughters. Holman has a two year-old daughter and a six month-old son. They both love reading to their children, and they're both eager to pass on the classics.